I will never forget the first time I read Susan Boase's book, Lucky Boy, after it was recommended to me by a fellow animal rescue friend. I loved the message, and I wanted to tell all my friends about her beautiful book. ARM wrote a story about Lucky Boy, and we consider it the perfect tool to inspire kids and young adults to grow up to become animal rescue advocates. Enjoy our interview with Susan Boase. If you find a copy of Lucky Boy, write us and let us know, and join me in asking Susan to consider republishing her wonderful book!! an illustration from Lucky Boy. Boase is the book's author and illustrator. Susan: Marie, thank you for approaching me to do this interview. It was a delightful surprise and an honor to receive the invitation. It is so interesting that when I wrote Lucky Boy I had no thought of publication nor a concept that anyone would be interested in reading this story. Since I don't have children, Lucky Boy is like a child I sent out into the world with hopes and dreams attached, not knowing what was to come. The fact that this book has been useful to the animal rescue community is a lovely outcome I had not imagined. 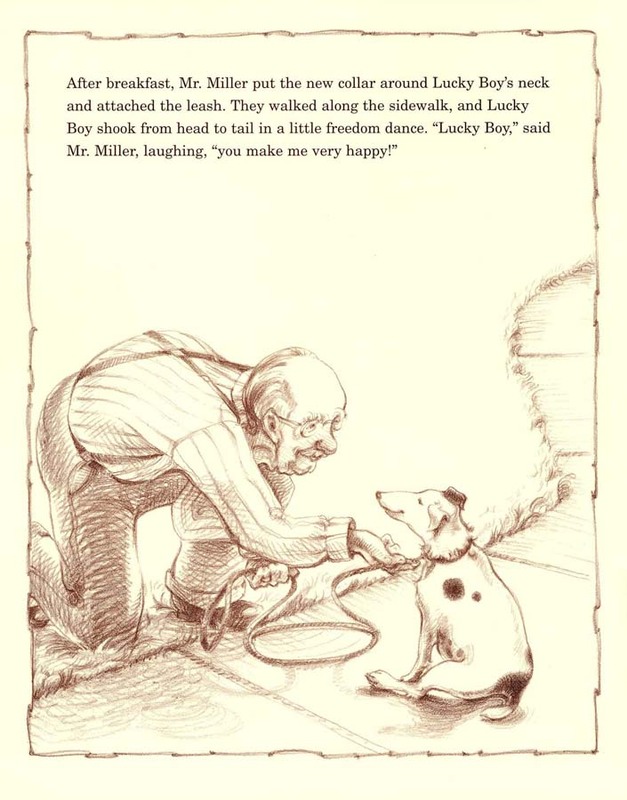 Even though Lucky Boy is now out of print, it makes me happy and proud that it continues to serve as a teaching tool for the humane treatment of animals. ARM: Tell me about the moment when you got the idea to write this book. What type of audience were you hoping to appeal to? Susan: Writing Lucky Boy was a very organic process for me. My mother had died in 1997 and my father was a lonely widower who would never have burdened my sisters or me with his loneliness. He was just "Dad", that stoic, happy fellow we could always count on and who never asked for anything for himself. During this time I regularly passed a lonely dog in my neighborhood. Somehow, these two sad stories called out for a happy ending, and Lucky Boy was born. To answer your question about audience, I had no idea who that audience might be, but was thrilled to find that it included people like you! A young Susan and her childhood dog, Dugan. ARM: Lucky Boy is inspired by a real dog. Can you tell us about him or her? Susan: Yes, the inspiration for Lucky Boy came from the "backyard dog" (a dirty lonely Dalmatian) I would see every day as I drove to work. You know how you tune in the radio (for me that is usually NPR) and you realize the story you are listening to involves: a. animals, and b. pain, and your first response is to switch stations because you don't want the sadness you are sure to feel upon hearing the story imprinted on your heart the whole, long day? Well, that's the way I felt every day when it came to this particular dog - not wanting to look, but always looking nonetheless, hoping to see a happy resolution to his story. ARM: Here in CA, I would say awareness to animal rescue causes is widespread and is growing every year. Your book was published in 2002. Do you see the same growth in awareness in your neck of the woods? Has this been a factor in your book gaining new audiences in recent years? Susan: You know, I’m sure that we are seeing the same growth in awareness you speak of in Oregon. I recently received the 2013 Annual Report from our Oregon Humane Society (OHS) and was pleased to note that 2013 was the “fourth year in a row that OHS has exceeded 11,000 adoptions”, which is the “largest number of adoptions from any single shelter in Washington, Oregon or California”. This number includes 4,837 animals coming from other shelters through OHS’s Second Chance Program. “When other shelters get overwhelmed by too many pets and too few adopters”, OHS sends a “special vehicle designed for long-distance animal transport to far-flung shelters” to bring Second Chance pets back to Oregon for adoption. ARM: Can you share with us one of your favorite Lucky Boy fan letters? Lucky Boy! What a treasure! Just love the story and your enchanting illustrations. Thank you so much writing and illustrating this captivating book that surely will touch the hearts of everyone who discovers it. It's going to be a big part of a new adventure ahead for me - as the new volunteer humane education coordinator at (my local) Humane Society, an outstanding no-kill facility. Lucky Boy will be a big part in our upcoming school & scout visits, children's book club, and more. It will also be the first book my rescued terrier will be reviewing in her new column. She's our new spokes-pooch. I recently adopted her. She spent the first three years of her life in a puppy mill. What a delight it is now having her at my side helping with humane education. When the book arrived in the mail the other day, I sat in the car reading it over and over. It's such a lovely, lovely story. Your message about the busy family really touched my heart - such a big thing in today's world - being busy, busy, busy. You took the message and turned it into a positive. Simply wonderful. Thanks again for Lucky Boy. It's a keeper! ARM: I have an animal rescue friend who regularly reads your book to kids at local Humane Education classes. Have you done this yourself, read your book to a group of kids? Susan: When Lucky Boy was first published I gave many readings at bookstores and volunteered to read it to a large group of teens interested in writing and illustrating. They were attending a summer camp sponsored by our Oregon Humane Society. ARM: Were you involved with any animal rescue causes or organizations before writing the book? After it was published, did it encourage you to join or participate in any animal causes or organizations? Susan: I have been involved with the Oregon Humane Society as a donor and have volunteered off and on over the years. I came to know Carol Shively (now retired) who headed up their educational outreach efforts for years. She was the first person in the animal rescue community to inform me that Lucky Boy was having an impact in this way and drew me in as a volunteer. ARM: Tell us about the artwork in your book. How did you decide the style and what Boy would look like? Susan: I had studied illustration at a small commercial art college in Michigan after high school and had always thought I'd love to illustrate a children's book. MANY years later I picked up a book called Writing with Pictures: How to Write and Illustrate Children's Books by Uri Shulevitz. It is a great primer on the subject of children's book illustration and I thought I'd write a story so I would have something to illustrate. My hope was that I could use my "dummy" picture book to show a publisher I could illustrate. The first editor who took a look (Ann Rider at Houghton Mifflin) offered me a publishing contract… what a surprise! The artwork itself started out as pencil drawings and the publisher, citing Make Way for Ducklings as a lovely example of a monochromatic picture book, decided to go with the pencil drawings in sepia. I was happy to comply! My little smooth coat fox terrier, Frida was my muse and model for Lucky Boy. ARM: Tell us about your own canine family members. Susan: I've always loved dogs, though my sisters and I only had one dog growing up. My mom and dad gave in to our constant begging and around my 10th birthday, brought home a wire-haired fox terrier puppy my dad named Dugan, after Jumping Joe Dugan a Major League Baseball shortstop and third baseman (1917 - 1931). Since my experience as a child had been with this crazy-fun fox terrier, my husband Greg Miller and I decided on fox terriers when it came time to add some wild energy to our household. Wyatt Earp, a wire fox terrier and Frida Kahlo, a smooth fox terrier added joy to our household for 14 years. After these two beloved family members passed away 4 months apart in 2010, it took us a couple of years to be ready, but around Easter of 2012 I started “just looking” (and you know how that goes!). We knew we wanted another terrier, but settled on rescuing a terrier mix. The first little boy I saw on the OHS website, one of the aforementioned “Second Chance” dogs from California, stole my heart. We showed up before the shelter opened and were first in line to meet “Kowalski”. He appeared to be a terrier-Chihuahua mix (what with those big brown eyes, wacky ears and the ballerina turn out on his front paws) and I was smitten, but it took a little bit of a sales job by this little guy to convince Greg. Kowalski approached my husband and stood on his hind legs, put his feet on Greg’s knees and gave him the sweetest kiss. We did change Kowalski’s name to Paco, as befits a little king from California. He is such a great little guy… full of fun and eager to please (though watch out cats and squirrels!). A great walker, Paco gets us out every day in the neighborhood, as did Lucky Boy for Mr. Miller! If it were up to me, I’d have a herd of terrier-mixes, but must be satisfied to act as “matchmaker”. You’ll find me frequenting rescue sites online and passing along links to friends who are “just looking”. Susan today with her dog Paco and husband Greg. ARM: Would you ever think about bringing the book back into print? Susan: Thanks for asking, Marie. I would love to get Lucky Boy back into print one day, and who knows... with the advent of self-publishing it is a real possibility, I’m sure. ARM: What kind of stories or illustrations do you create today? Susan: I’ve illustrated a few chapter books by other authors, published by Henry Holt and continue to write and illustrate with hopes of another picture book or chapter book of my own in the future. Writing and illustrating is a wonderful life and once it hooks you, there’s no escaping the pull. I'm a member of and regularly attend SCBWI (Society of Children's Book Writers and Illustrators) conferences to hobnob and network with other children's book snobs (kidding!). You can see more of my illustration work by visiting my website www.susanboase.com. ARM is grateful to you. We are fans for life! Have you read Lucky Boy? Let us know what you think, and if you agree that we need more copies of Lucky Boy!